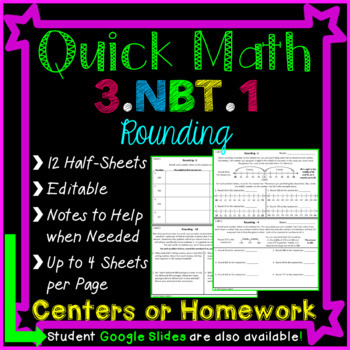 This homework, or classwork, pack includes 12 half-sheets that are specifically aligned to 3.NBT.1. However, because the focus is on rounding to the nearest ten or hundred, it would also be good for any classroom/student practicing and/or reviewing basic rounding. 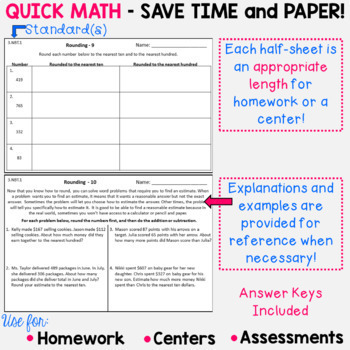 This homework comes with a PDF version and an editable version so that changes can be made if necessary. I feel homework should closely align what is done in the classroom, so having an editable version available was important to me. There are two half-sheets to a page, so if you print this front to back, you will have 4 nights of homework on one page! This homework shouldn't take students much time to complete, and the examples provided on some of the pages will provide explanations to students and parents. This homework is based on how to round conceptually. I did not incorporate any type of rap or tricks associated with rounding. I believe learning how to round conceptually builds a stronger foundation for numbers thus building a student's number sense. 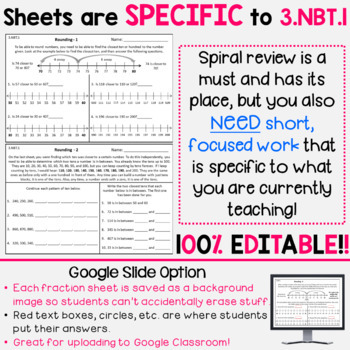 These would also make great sheets in a math center since they're short and most have explanations and/or examples.